(Nanowerk News) Soon it may be easier to design, plan and carry out infrastructure operations in deep water. The EU project called SWARMs aims to achieve this by integrating autonomous vehicles such as ROVs and AUVs. In the years ahead, the number of infrastructure operations carried out in deep water will increase. Oil and gas production is moving into increasingly deeper waters, offshore wind turbines and wave energy plants are being installed, and minerals on the sea floor are waiting to be exploited. This will mean an increased need for robots that can construct, maintain and monitor the necessary infrastructure. Many subsea tasks are currently performed by human divers. But divers are few and the tasks often hazardous, so the subsea industries are looking for alternatives. 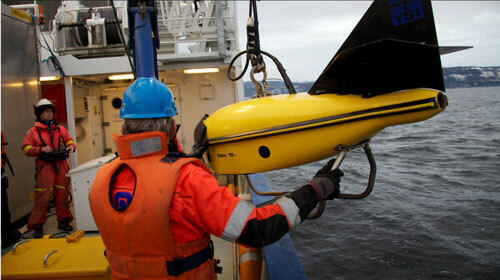 The solution lies in the greater use of unmanned submarine vehicles such as AUVs and ROVs. The only problem is that currently these vehicles are tailored for specific tasks, and this explains why they are difficult to operate and expensive to use. The EU project SWARMs aims to simplify the design, planning and implementation of subsea infrastructure operations. Norwegian partners SINTEF, NTNU, Maritime Robotics, Inventas and Water Linked will be working together with more than thirty major technology companies, universities and research institutes from all over Europe to design and develop a set of hardware and software components. The integrated platform will be installed in submarine vehicles currently in use. One of the aims of the project is to enable a "SWARMs system" of unmanned submarine vehicles to carry out complex tasks without low-level control by human operators. SINTEF is planning to advance a methodology previously developed in-house and designed, among other things, to break work operations down into an autonomous system. All those involved must have a joint understanding of the operations that have to be carried out during both the design and operational phases. This will make it much easier for them to integrate the correct behaviour into the system. "Our aim is to enable greater autonomy and interaction between the different vehicles and thus provide opportunities for new applications and costs reductions", says Gorm Johansen at SINTEF ICT. Five different user scenarios, including the inspection of subsea structures and emissions monitoring, will be demonstrated in Norway, Romania and on Gran Canaria. The Norwegian demonstrator will enable software and equipment supplied by many of the different SWARMs to interact together. It will be tested outside the Høvringen wastewater treatment plant in Trondheim during trials planned for early spring 2018.